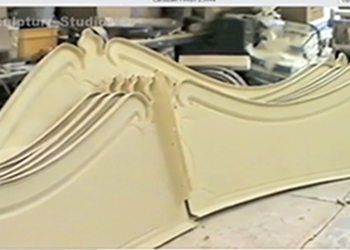 Polystyrene / styrofoam carving of architectural detail made for Qatar. 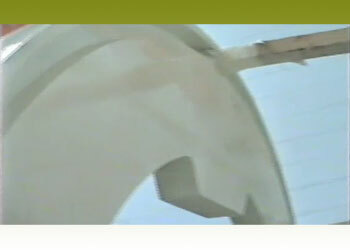 Covered in a layer of plaster for durability. 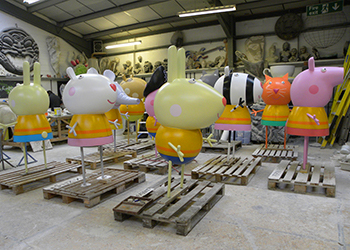 Sculpture Studios' largest project to date. 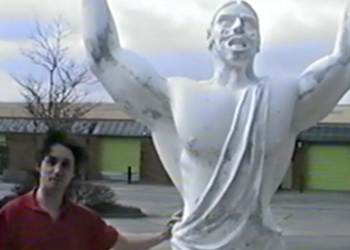 Ressurected footage from 1996. Made for Smilin' Sam's entertainment areas. Produced 360 individual panels in an old western themed style to cover 15 thousand square feet of space. 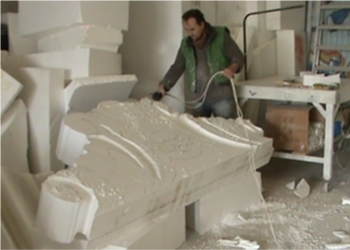 Made from polystyrene / styrofoam, fire protected, and artworked. 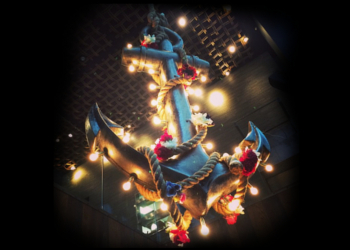 Installed permanently in three different locations around the UK. 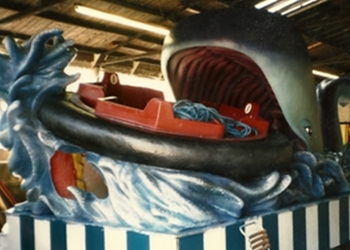 Seven metre long dragon theme park ride. 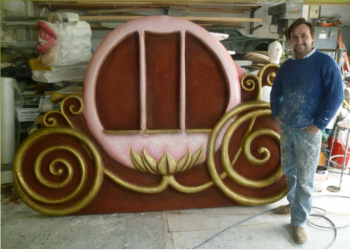 Polystyrene / styrofoam carving then cast in GRP with structural metal work support, fixed to the Dragon Falls log flume ride. 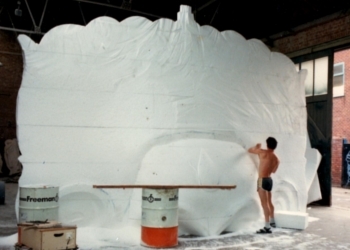 First a maquette was made and approved, then a full scale polystyrene / styrofoam carving was created, approximately 12 metres tall. 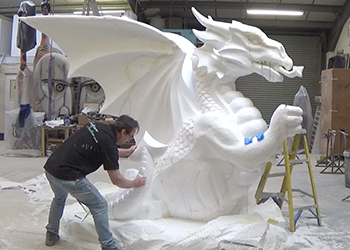 Two heads were then produced in glass fibre and positioned either side of the Dragon Falls theme park ride. 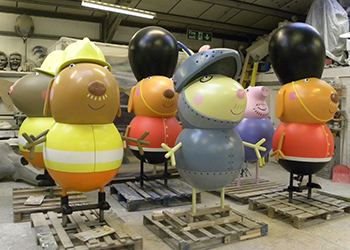 Characters from the popular children's television program, created for Peppa Pig World at Paultons Park. The theme parks 2018 new rides include the Queen's Flying Coach Ride and Grampy Rabbit's Sailing Club. 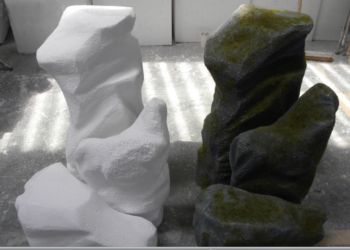 Figures first carved from polystyrene, and moulded and cast from glass fibre. Painted and artworked with 1k car body paints, with internal metalwork for the arms and legs. 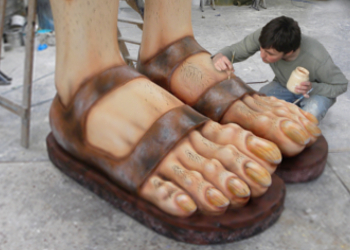 Giant feet and legs created for the Redbridge Primary School in Ilford. 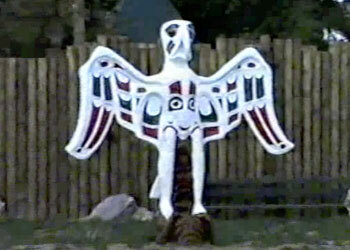 Carved from polystyrene / styrofoam, with a blanket coat of glass fibre and artworked. 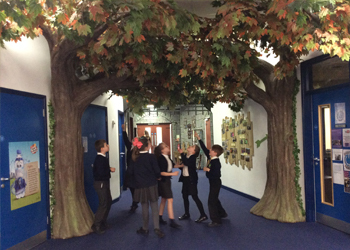 Inspired by the recent movie release of The BFG, to be left as a gift for the children of the school. 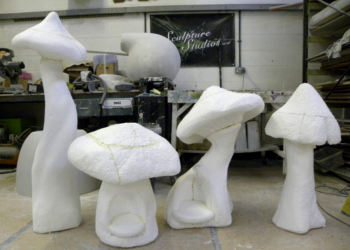 Giant mushrooms created for Tropical Birdland in Leicester. 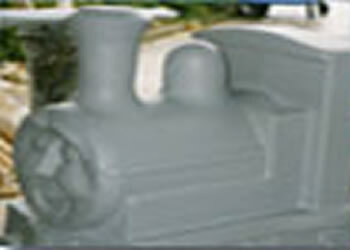 Carved from polystyrene / styrofoam, and covered witha blanket coat of glass fibre, finished, and artworked with 2k car body paints. 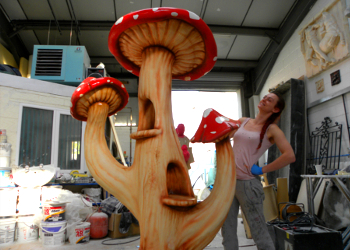 Designed to light up and be displayed on a fairy walk for children. 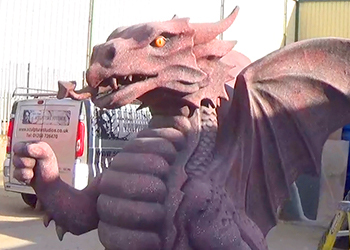 Welsh inspired stone red dragon, carved from polystyrene / styrofoam, with a blanket coat of glass fibre and a flexible concrete render. Artworked to resemble red stone, and positioned to hold a flag pole. 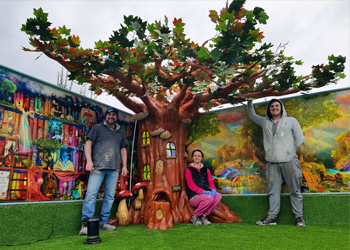 Enchanted magical fairy tree created for The Gardens Daycare and Nursery School in South West London. 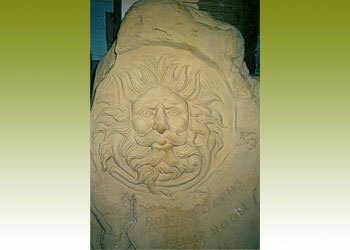 Carved from polystyrene, with a blanket coat of glass fibre, rendered with a flow coat of resin, and artworked. Built to break down in multiple pieces for transport and installation. 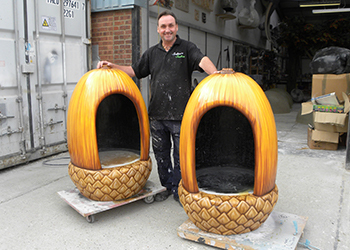 Giant Acorns carved from polystyrene / styrofoam, moulded and cast in glass fibre. 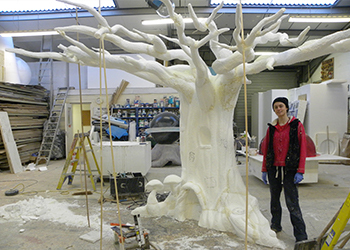 Two trees, carved from polystyrene / styrofoam with a blanket coat of fibreglass, finished with fake leaves. All created for the Hartsholme Academy in Lincoln. 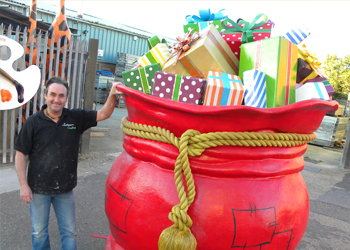 Giant Christmas Santa's Sack created for Swansea Christmas Parade. 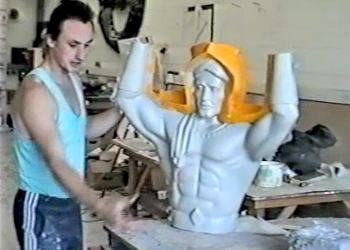 Carded from polystyrene / styrofoam, with a blanket coat of glass fibre, and render artwork. 2m wide by 2.5m tall. 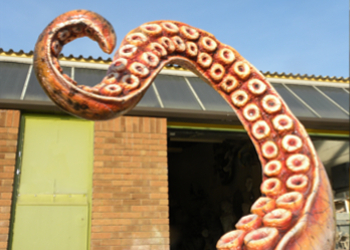 Giant tentacle, carved from polystyrene, finished in glass fibre and airbrushed. Created for Miss Aniela art and fashion photographer, for the promotional launch of the new Nikon D810. 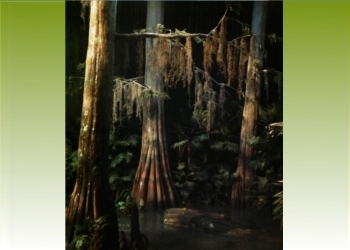 A production of nine Amazon swamp trees, made from glass fibre, taken from silicone rubber moulds, broken down into sections, painted and artworked for display exhibition set. 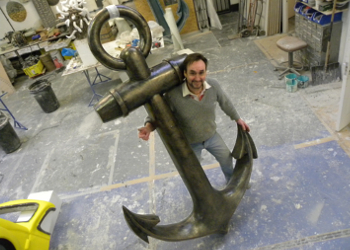 Created for a company called Tattu, these anchors were carved from polystyrene / styrofoam, had a glass fibre production mould made, and casts made from fibreglass. 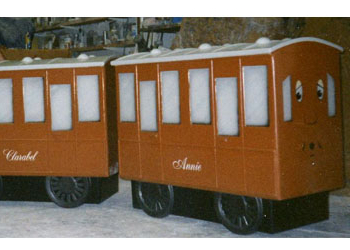 2meters long, with internal space for metalwork and lights. 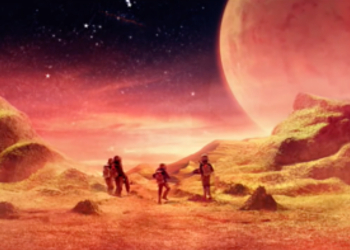 Space set created for the 2016 Clydesdale Bank commercial. 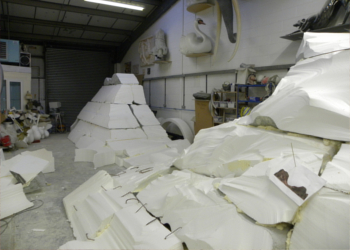 Commissioned by Philip Shaw from Plumred Limited, created from polystyrene / styrofoam, and rendered with plaster of paris. 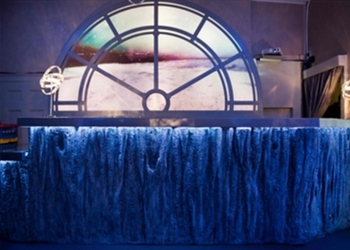 Scenery created as one of multiple sets for the television advert. 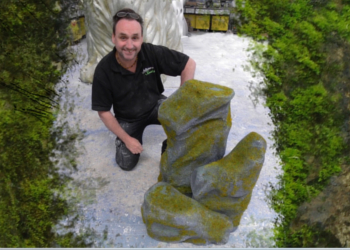 Sculpting large hands for stools and tables. 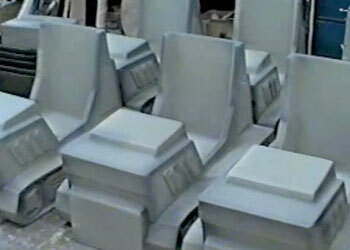 Carved in polystyrene / styrofoam, production moulds made and casts in glass fibre. 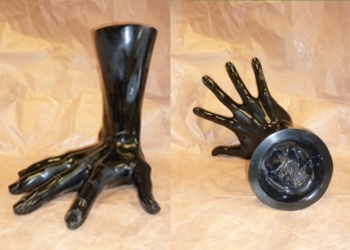 These hands will eventually be finished in a chrome paint effect. 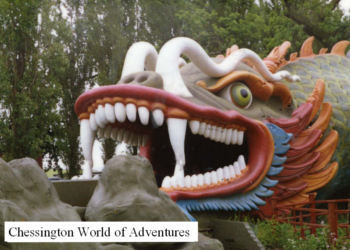 Polystyrene / styrofoam carving four metre tall then finished in glass fibre sculpture created for Chessington World of Adventures theme park. Metal work fixed internally. 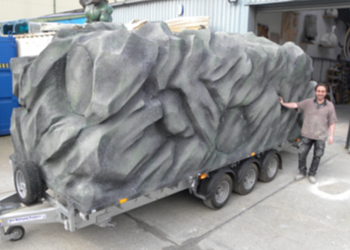 Large rock caving tunnel, created on a trailer for a mobile caving childrens attraction. 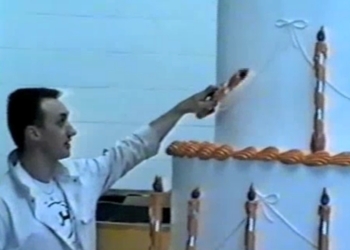 Existing tubes made from glass fibre. 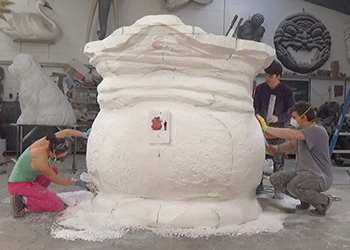 Clad in polystyrene / styrofoam and carved. Stickyback foil with a layer of fibreglass. Spray on concrete texture render, and art worked. Mothercare Thomas the Tank Engine shop display units. 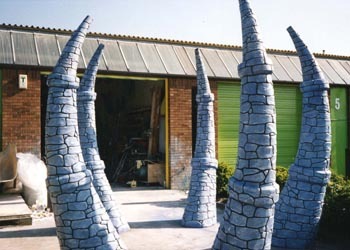 Patterns, moulds and several casts made from fibreglass and then painted. 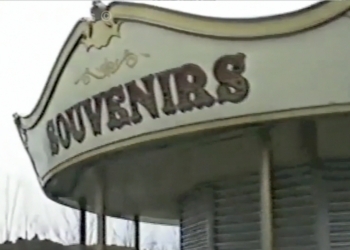 Used in themed event. 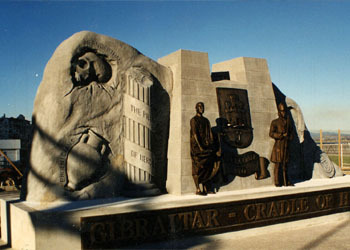 Public sculpture for Gibraltar. 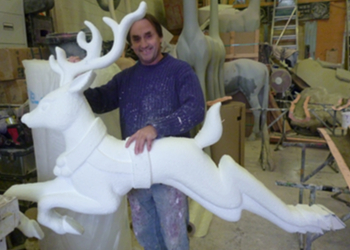 Polystyrene / styrofoam carving then made from glass fibre, made to with stand the weather in Spain. 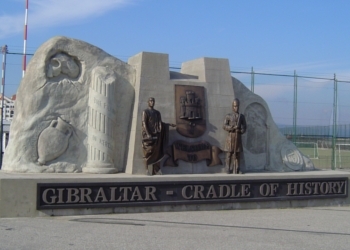 This was placed to remember all the different historical events connected to Gibraltar. 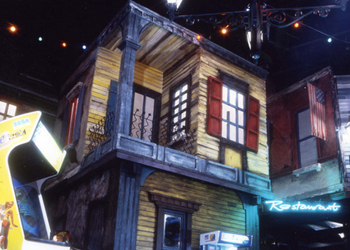 Themed nightclub entrance. 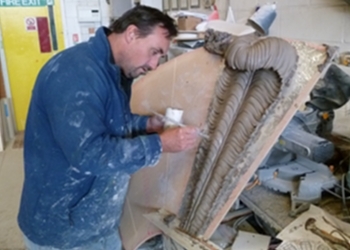 First a polystyrene / styrofoam carving was made, then moulded in glass fibre with internal structural support. 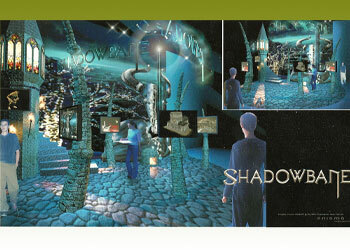 American themed fantasy exhibition stand for new interactive games console. Made from glass fibre with internal metalwork to hold flat screens and games console units. 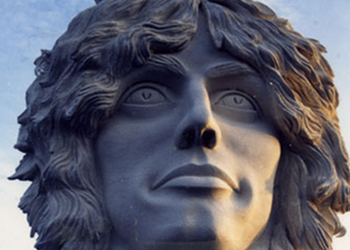 A 7 metre tall polystyrene / styrofoam carving of a Syd Barrett head with a textured finish. 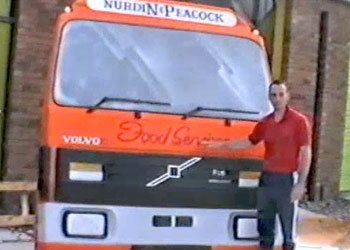 Produced for a video promotion. Made strong but light enough to be carried by students. 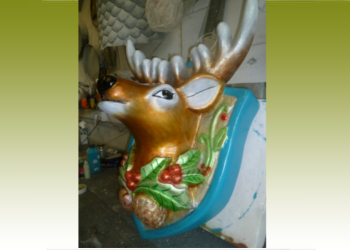 Fibreglass reindeers, carved from polystyrene, glass fibre moulded and cast, for a christmas themed fairground ride. Interactive games console stand. 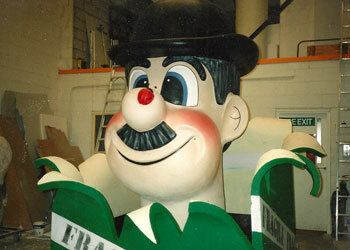 Polystyrene / styrofoam carving finished in fibreglass, used for themed event. 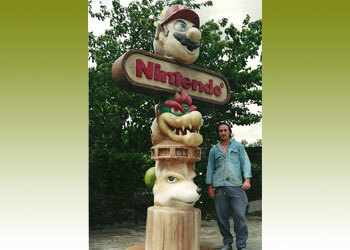 Totem pole standing 3m tall, made for Nintendo with interactive games holder. 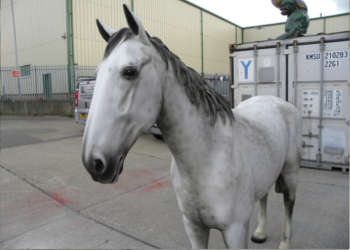 Grey Mottled horse, cast from glass fibre, life size, with airbrush artwork. Liftable between two people. 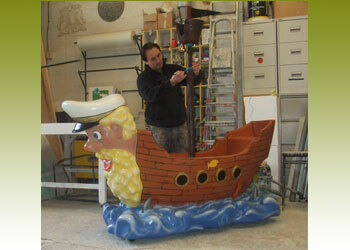 Large scale prop fruit for touring exhibition display. 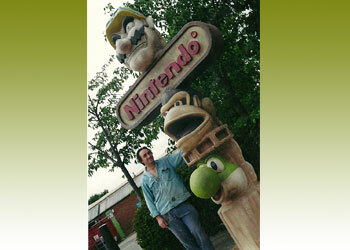 Large fruit polystyrene / styrofoam carvings and cast in glass fibre, with a car body finish and airbrush art worked. 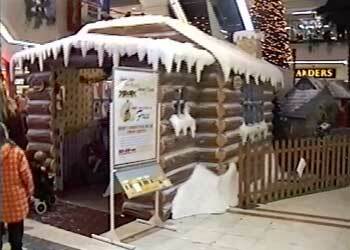 Used to theme an exhibition area. 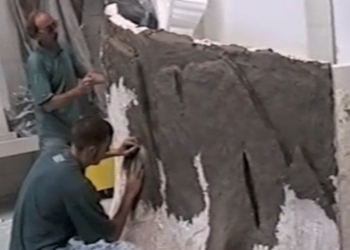 A glass fibre wall, designed to resemble the moon's texture. 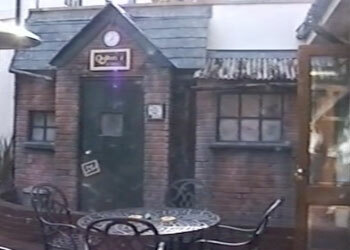 Fitted on location to enhance a themed bar area. 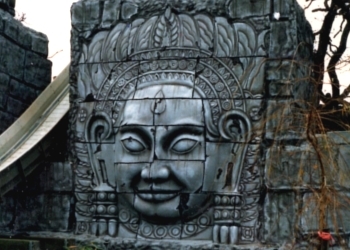 Originally carved in polystyrene / styrofoam and moulded in plaster. 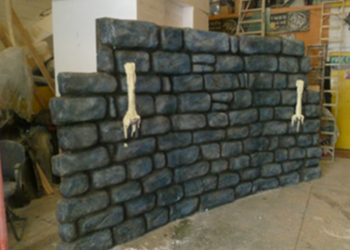 Creating backdrop displays for a school, in the style of Disney-esque sets. 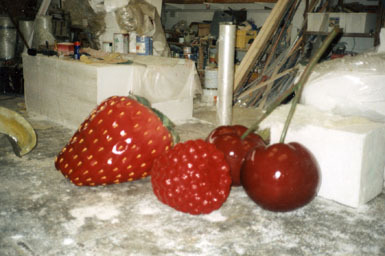 Carved from polystyrene / styrofoam and then artwork with emulsion paints. 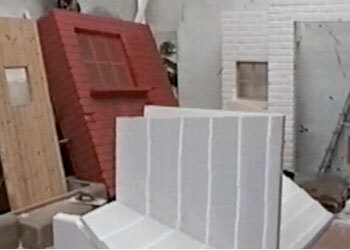 Polystyrene / styrofoam and clay carvings, creating Christmas themed props for shop display window decoration. 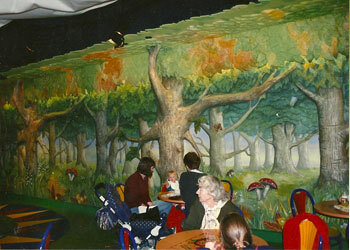 Many fibrous plaster wall sections depicting the Enchanted Forest for Mothercare World. 52 panels in total, placed together and painted. 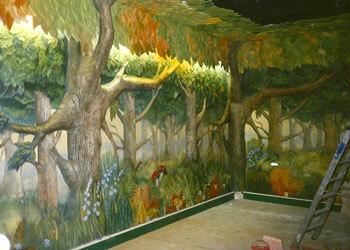 Each panel is eight foot by four foot. 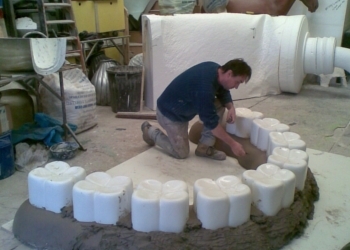 Seating area based on a set of teeth, an interactive wall and a large toothpaste reception desk. 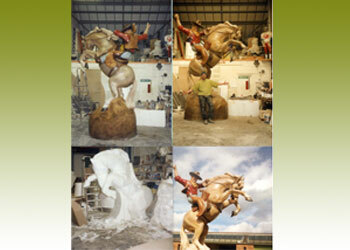 All made from polystyrene / styrofoam carvings then finished in FR grade glass fibre. To theme a dentist waiting room. 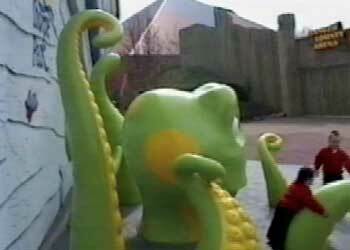 The teeth bench contained seats for children to sit on while watching a large screen. 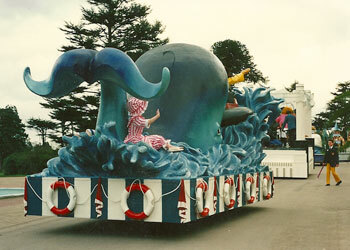 Themed float for midday parade at Alton Towers theme park. 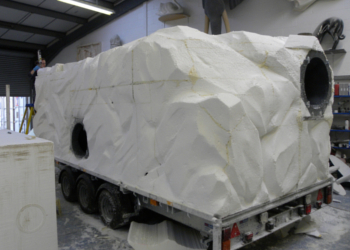 One float of many types, made from a polystyrene / styrofoam carving and then coated with glass fibre. 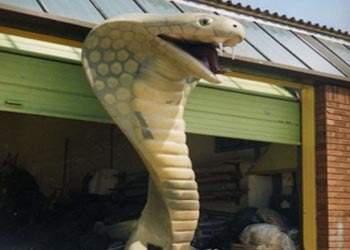 2 snakes, initially carved from a polystyrene / styrofoam, then moulded and cast in glass fibre for the Rameses Revenge ride at Chessington World of Adventures. 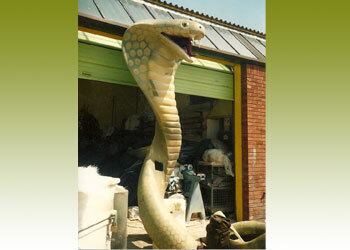 The snakes were carved to look like giant cobras wrapped around a pole as if entwined, with the fibreglass painted. 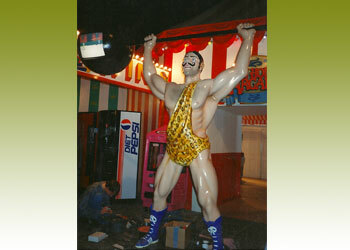 A free standing man, carved from polystyrene / styrofoam, finished in fibreglass with a metalwork structure and airbrush painted. Also made to accept TV monitors in each of the weights. 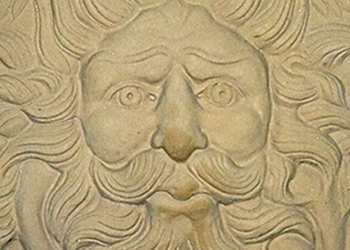 A semi-relief sculpture, made from glass fibre and a stone mix. It was then sandblasted back to expose stone surface. Eight tablets were made in all, each with a different theme. 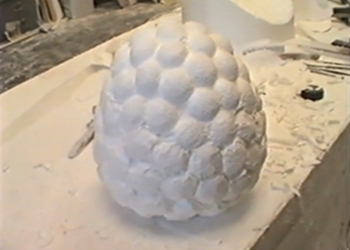 A polystyrene / styrofoam Christmas decoration for an exhibition display. 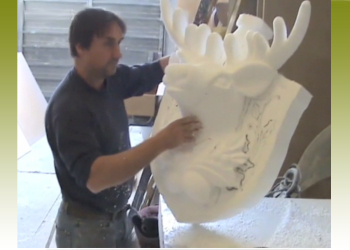 Working from an actual tree ornament, the object was scaled up and carved in polystyrene / styrofoam as two parts (reindeer head and shield) before being fixed together. 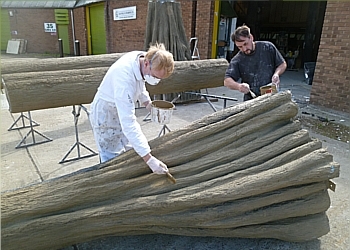 A layer of soft filler, painted and varnished with FEV. 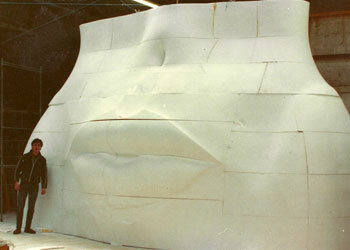 Polystyrene / styrofoam carving of a large pair of hip, lips and breasts for an opera. 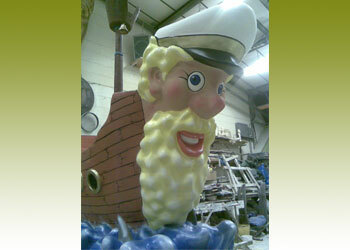 Produced in sections with the final finish in fibreglass. Custom built children’s furniture to partition a bedroom without the use of walls. 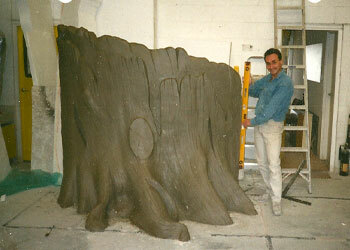 Tree stumps and other bedroom furniture made from fibreglass and painted. 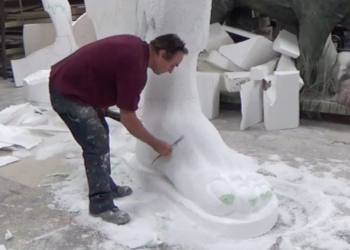 Each set built from a polystyrene / styrofoam carving, finished in fibreglass and rendered in concrete, to represent a part of England. Made in modules to fit together on site ready to be dressed with Lego buildings. 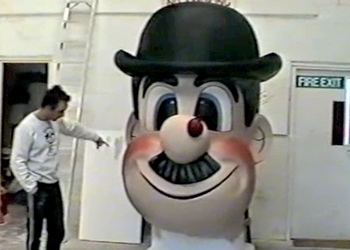 Larger than life polystyrene carving of a head logo. 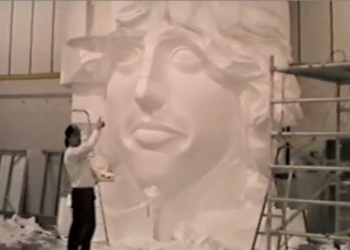 Carved from polystyrene and art worked in emulsion paints. 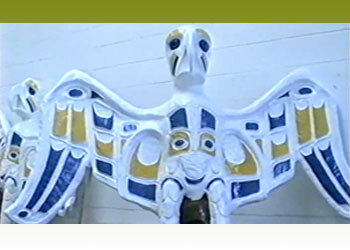 Bird totem pole made from glass fibre, with structural metal work to be planted into the ground and finished in long lasting paint. Four made in all. 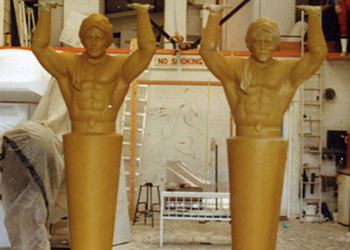 Made from glassfibre and finished to a high gloss standard. 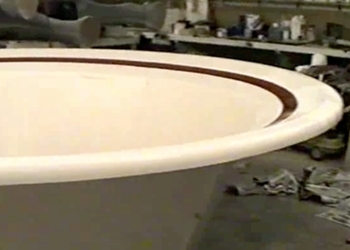 The bowl was made in four sections which could be bolted together with a perfect invisible seam line. 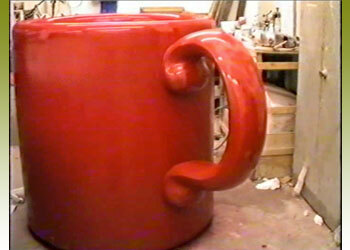 Both bowl and mugs were extremely durable. 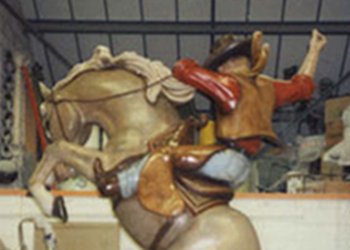 Shops surrounds for a theme park in the style of a carousel, made from glass fibre. Small diggers and jeeps made for juvenile rides. 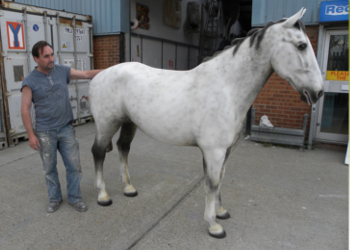 Patterns, moulds and final casts were made from glassfibre and finished in 2K paints. 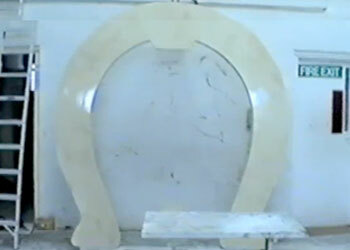 Fibreglass archway made to resemble marble. 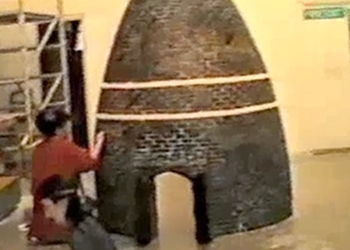 The back of the arch has neon tube lighting up the peripheral edge, giving a warm glow. 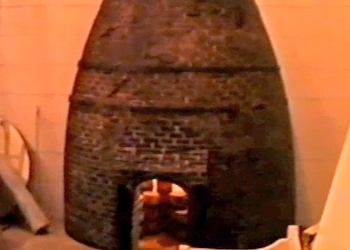 Small scale model of Gladstone kiln. Made from polystyrene / styrofoam and protected with scrim. Painted with firecheck paints then French enamel varnish to add colour. Also with interior lighting. Polystyrene / styrofoam carving and covered in scrim. Made for short display for a cash and carry company exhibition. 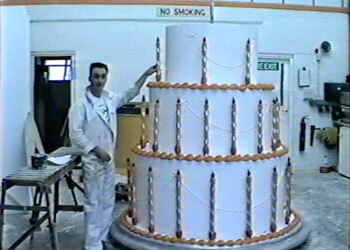 A large polystyrene / styrofoam carving of birthday cake made for Basildon County Council to celebrate their 40th birthday. 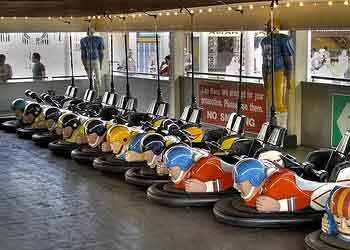 Made to go onto the back of a flatbed lorry in a carnival. 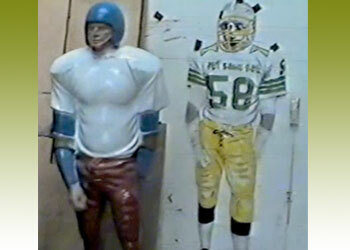 Polystyrene / styrofoam carving of footballer figure. 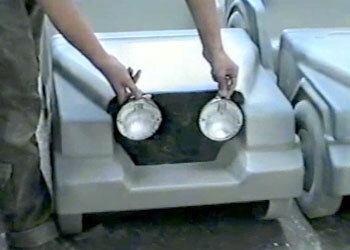 Production mould made and six casts taken in fibreglass for a bumper car ride. 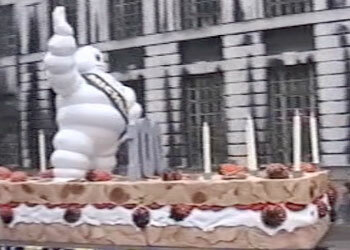 Large polystyrene / styrofoam carving of a cake, celebrating Michelin's 100th anniversary, to sit on top of a float in the Lord Mayor's Show, London. A one day only display. 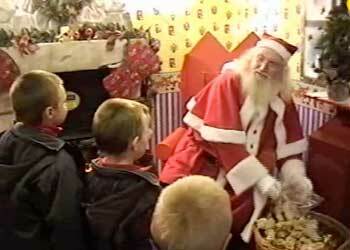 Santa's Grotto made for a shopping centre in Basildon Eastgate. 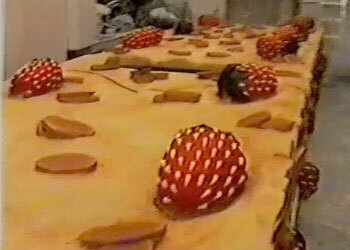 A reusable display and props made from a fire-rated polystyrene / styrofoam carving and scrim. 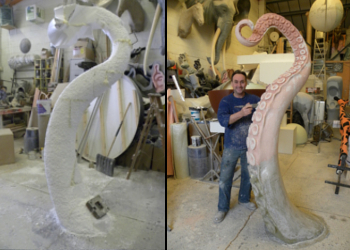 A giant octopus polystyrene / styrofoam carving, with moulds then taken and cast in fibreglass, made for Thorpe Park. 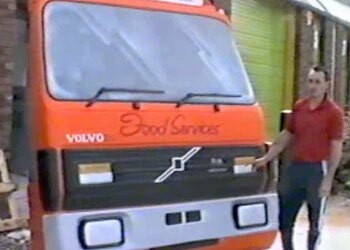 Made from glass fibre with a durable paint finish plus internal metal work. 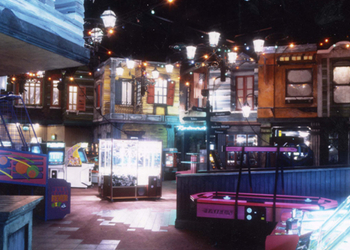 Court yard themed area made to look like old school playground with running water and light effects. 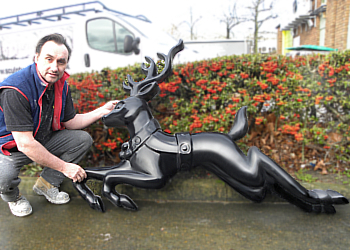 Polystyrene / styrofoam carving finished in fibreglass and painted. Made to encourage children's literature. Concepts taken from children’s drawings were incorporated into the end design, which was a polystyrene / styrofoam carving, coated in glass fibre, set on wheels and magnetic painted for the children to add sea creatures, fish and shells to the boat's surface. Deemed a great success.